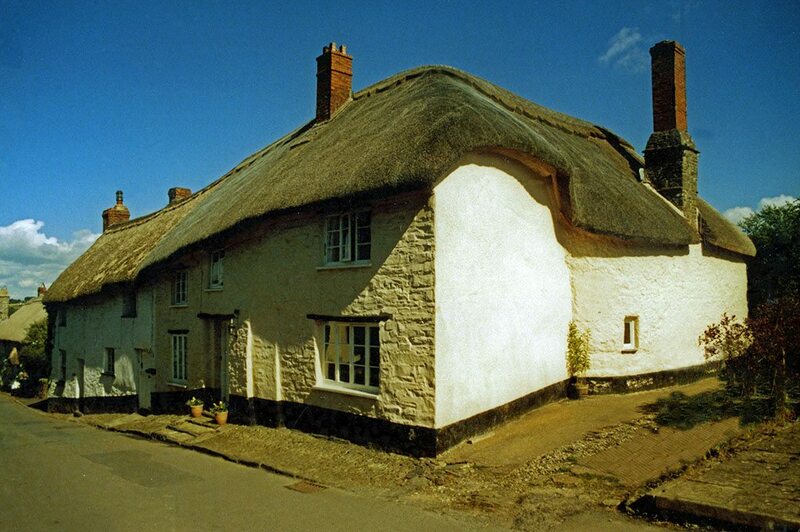 This historic county holds between a fifth and a quarter, of all Britain’s surviving thatch; there is much to see. Not unexpectedly thatching has often interested the many visitors who flock to this attractive area. 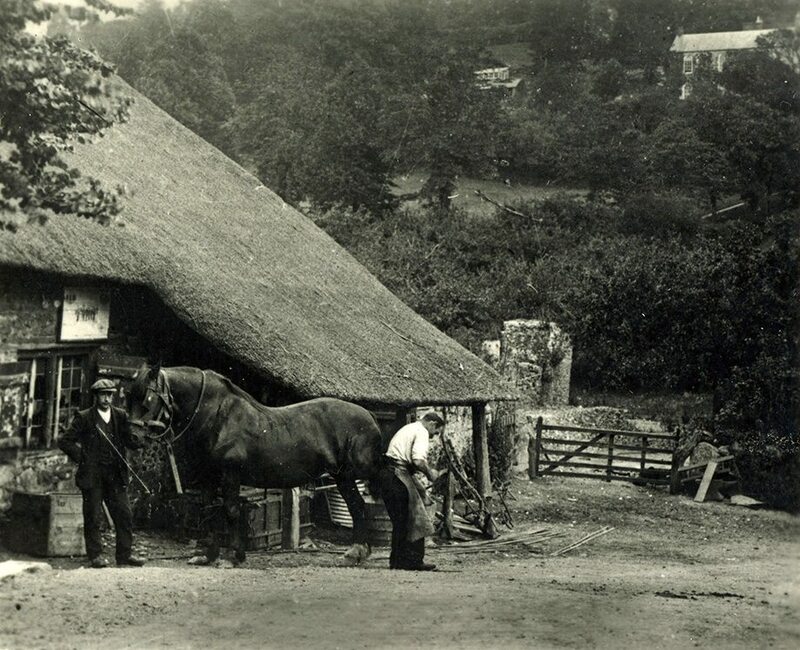 One such, from the very end of the Victorian age, has left us a trail which can still be followed, and forms the next page… (Devon Thatching in 1901 ) And in 1808 one Charles Vancouver published his Agricultural Report on the county; in which he has a little to say on the craft. 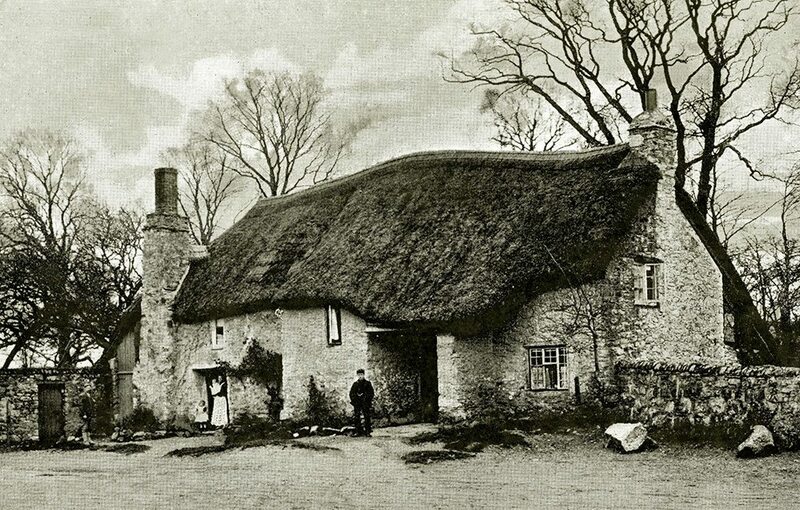 As with most authors, of the Agricultural Reports in the West Country, he was mainly concerned with the production of the combed thatch he found. 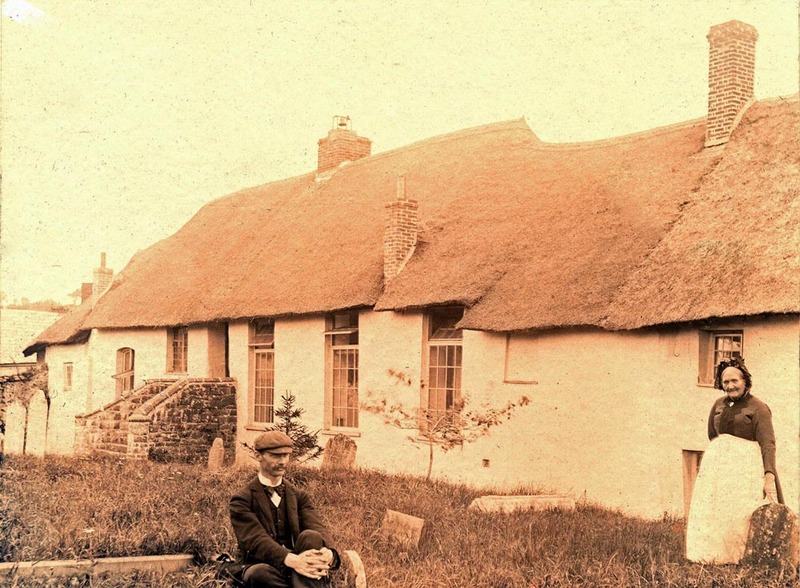 To him this was worth noting, as then combed cereal thatch was a minority material, confined to the South West of Britain. Which many of the authors, of the various other Agricultural Reports, thought superior, to the long straw thatching seen elsewhere. 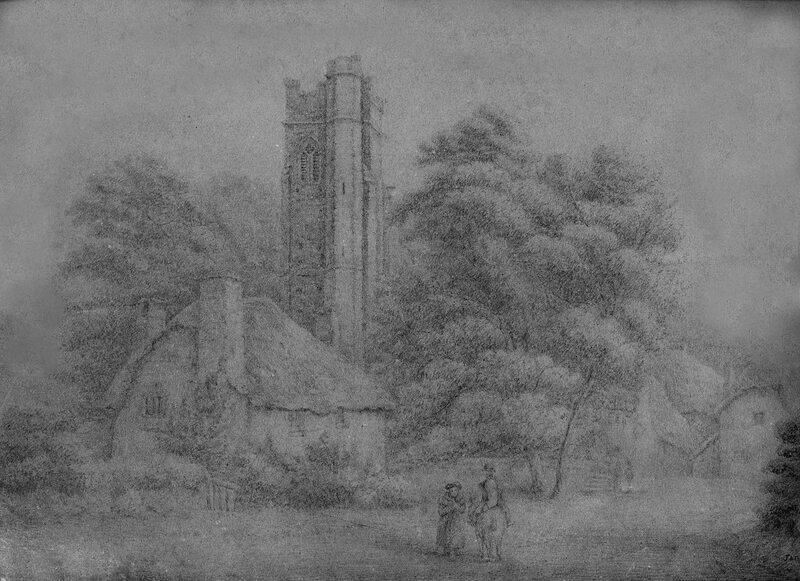 Georgian thatch… ‘Stoke Cannon near Exeter, from a sketch made in 1826’. 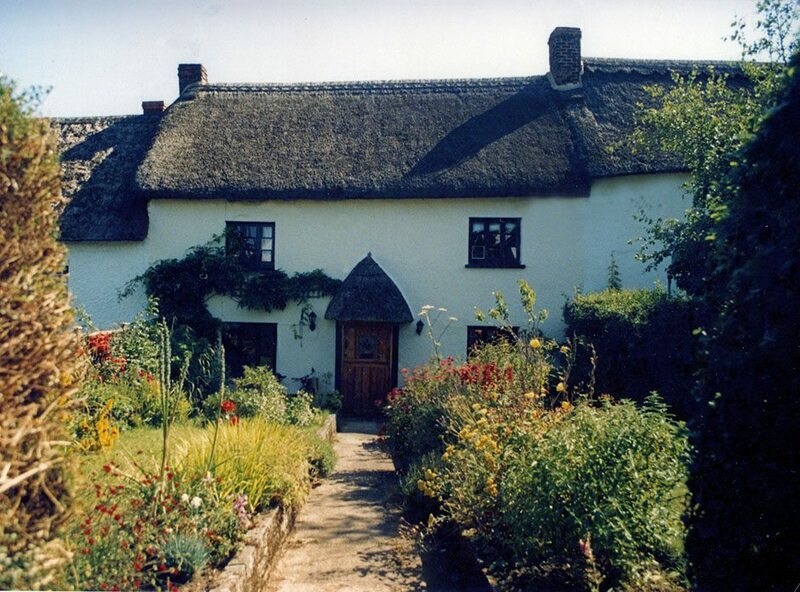 Devon thatching captured by one Jane Johns. The Devon reporter states that to thrash out, comb and tie six 28lb bundles of wheat reed, is called a ‘common day’s work’ and earned the farm worker between fourteen and sixteen pence; plus three pints of cider… This was the standard weight of a nitch of reed, as mentioned in the relevant page, in the Materials section; where a lot more information regarding this material is found. found here, very similar to the modern ones. However, there is less repair work seen these days and more in the way of ornamental ridges. Unchanging scene… At Broadhembury. 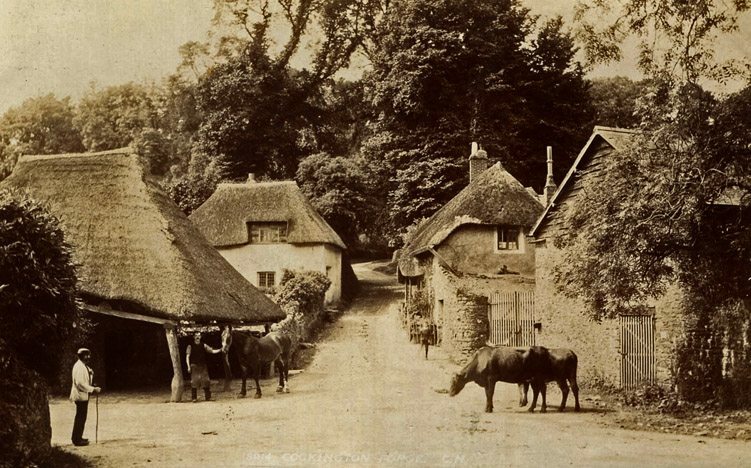 The upper images show the village shop a century apart. The Edwardian thatchers are applying a multilayered coat of combed thatch; stripping the old thatch as they go. The same type of work as depicted in the modern image and on all the plain roofs, in the lower photo. Which have also remained much the same, in this village. 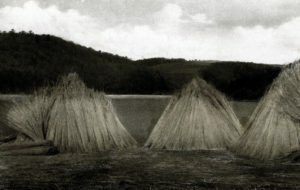 Along with several other maritime counties, Devon also had its water reed beds. On the beach… At Torcross, in around 1885. Situated on the strip of land dividing Slapton Ley from the sea. The reed beds and lagoon are clearly visible, at the top of this splendid image. The beach runs down from the houses. 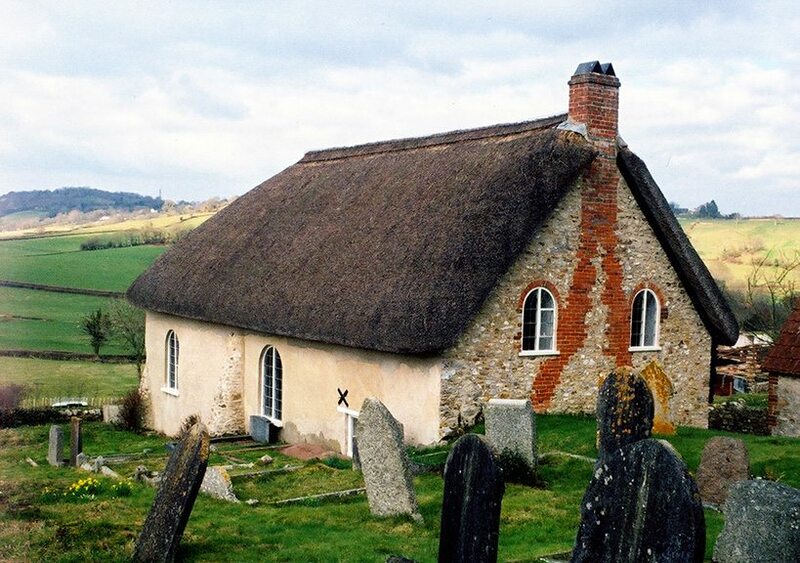 There is a lot of thatch shown here; but was it local reed or combed wheat? 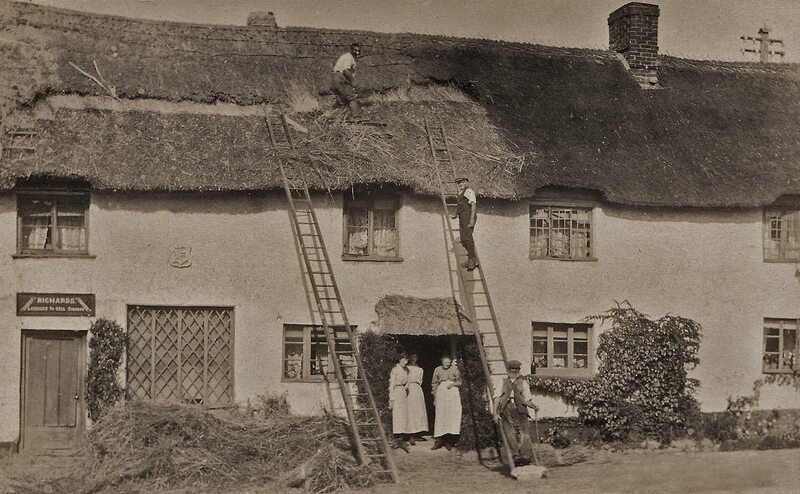 The prominent cottage, in the centre of the houses, shows some repairwork, very likely completed with local water reed, as the fixings are too widely spaced for cereal straw. 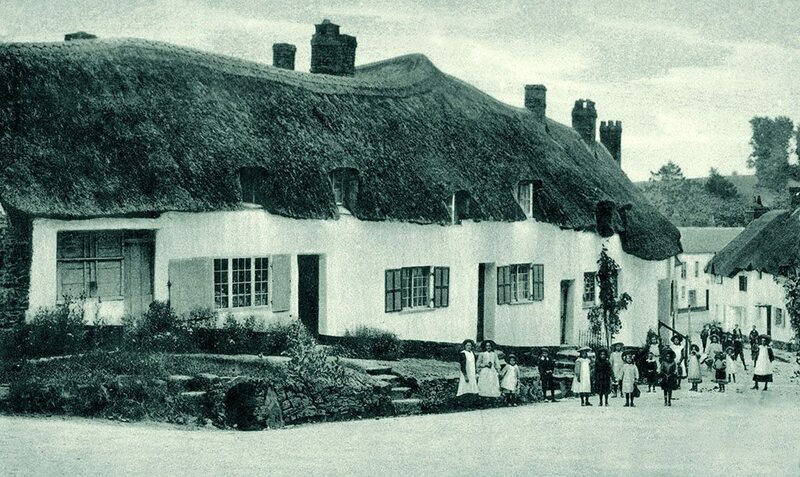 This cottage is still thatched, the lagoon is now an important nature reserve; and the beach sports some rather heavy duty sea defences… And the stage coach ceased running some time ago. 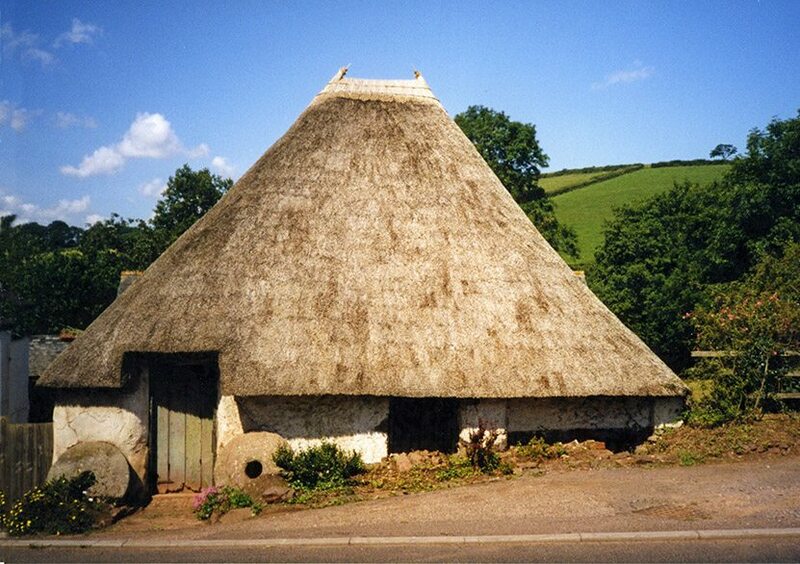 Today most corners of Devon still have their gently curved roofs; all following the South Western tradition. 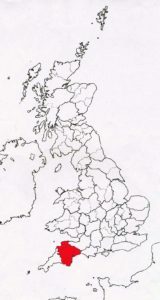 But as might be expected, in such a large area, there is a little variation. The roof shape is slightly more curved in the east and south and the eaves a little wider. The flush ridges in the north are that little bit plainer; but not a lot. Another beach, more thatch… At Sidmouth. 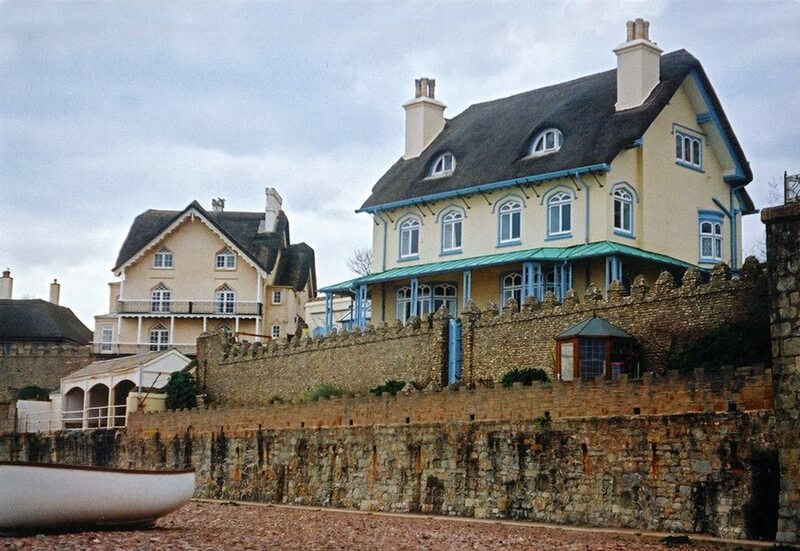 Where a splendid group of early nineteenth century, ‘Cottage Orne’ properties, grace the seafront. More seaside thatch… The old images above, show roofs that are mostly still extant. The left at Paignton is one of many thatches in the Torbay area. 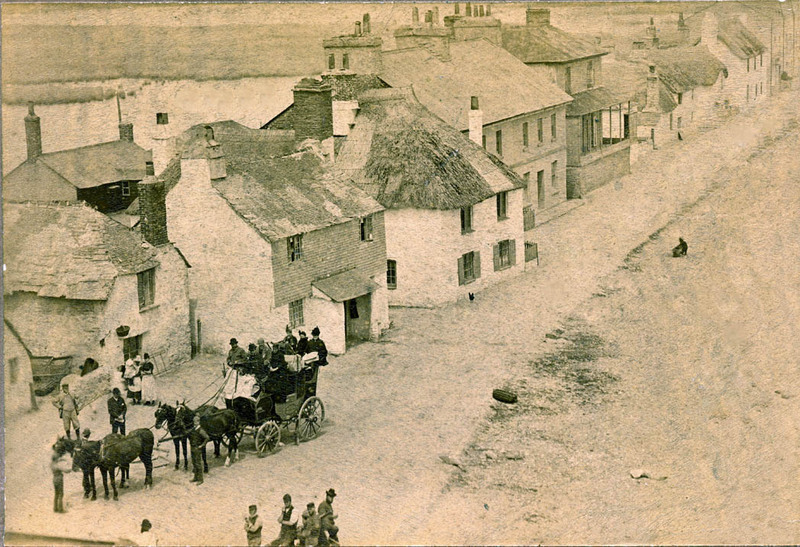 The right hand Edwardian scene at Hope Cove, is still to be found, although the cottages now contain few fishermen. Torbay thatch… Perhaps the most photographed scene in the county, at Cockington. Images of the well known forge appearing in countless forms, over many years. 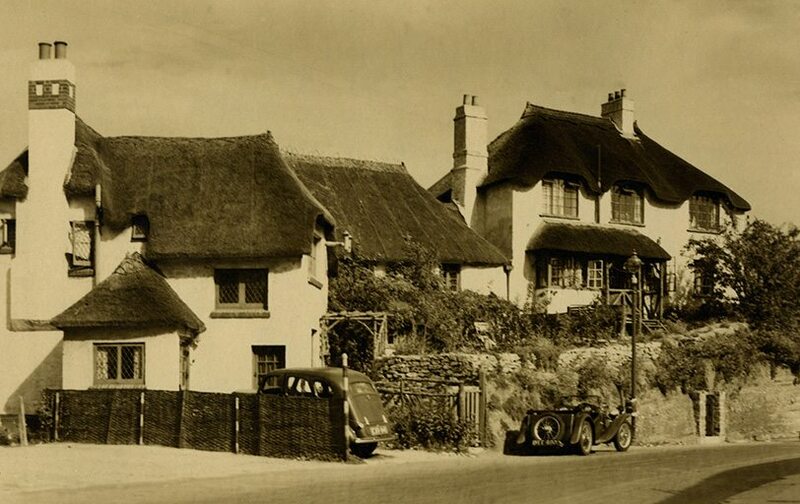 This early photo, shows some neat, plain combed thatching. 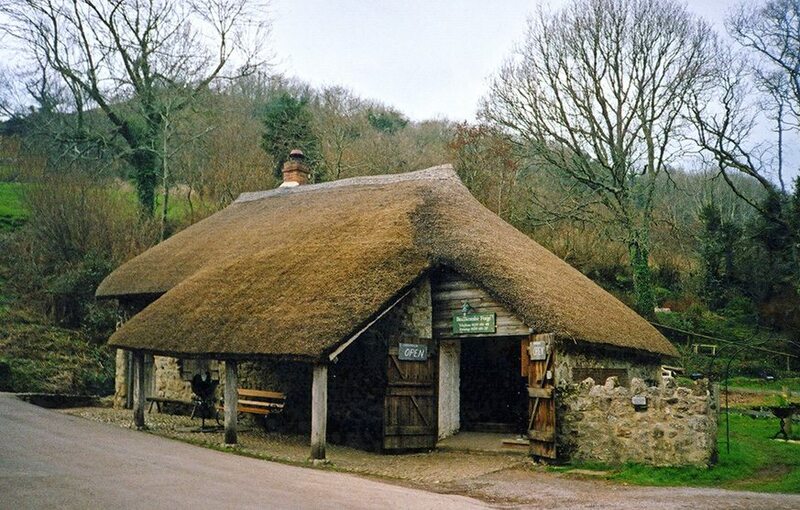 Functional thatching… On another working forge, at Branscombe. Like the one at Cockington, this also dates from around 1800. The 1920’s image, shows little has changed. Below, another functional roof, is covering a rather exotic looking barn, at Stockleigh Pomeroy. North Devon… Thatch above, at Croyde; with a large eaves chimney, a Devon feature, along with the palm trees… Below is neat combed wheat reed, at nearby Georgeham. 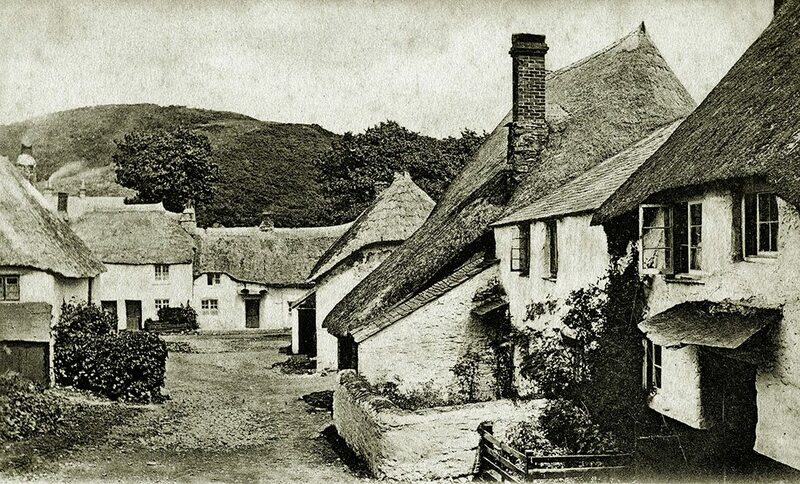 Long rows… The Edwardian scene, at Newton St Cyres is still typical of many Devon villages. 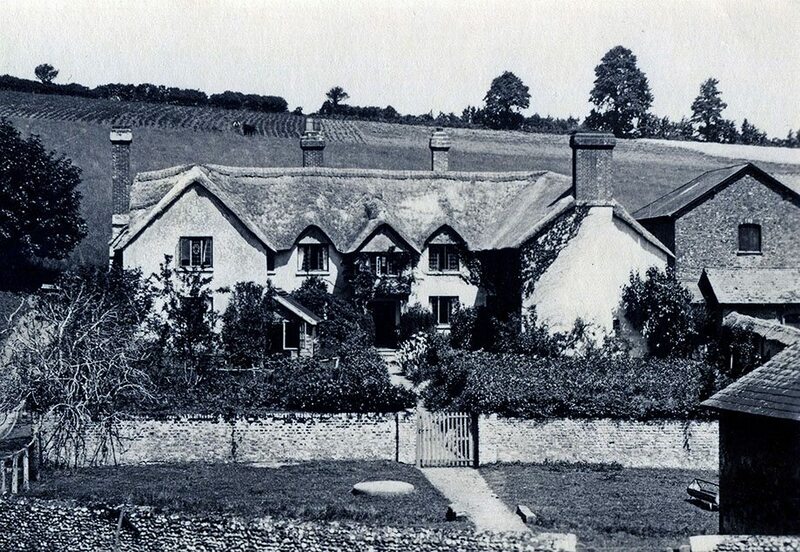 Unusually cottages were lost here, in the last century, to the straightening and widening of the village roads. But most of what is shown remains. 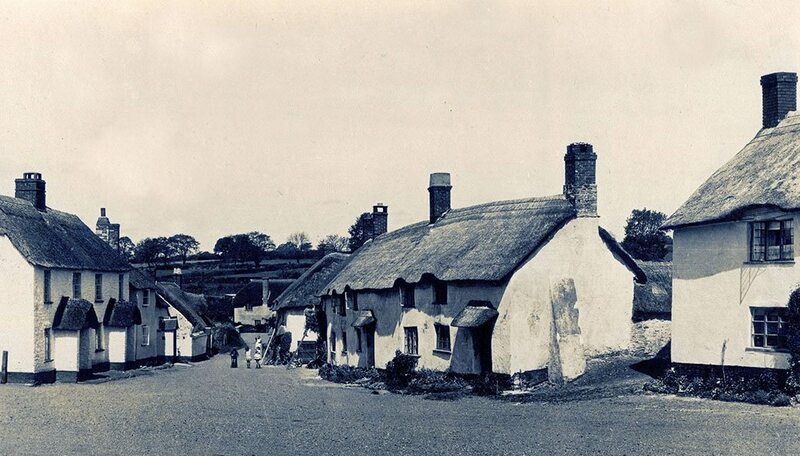 The unassuming cottage on the right lies in Morchard Bishop. 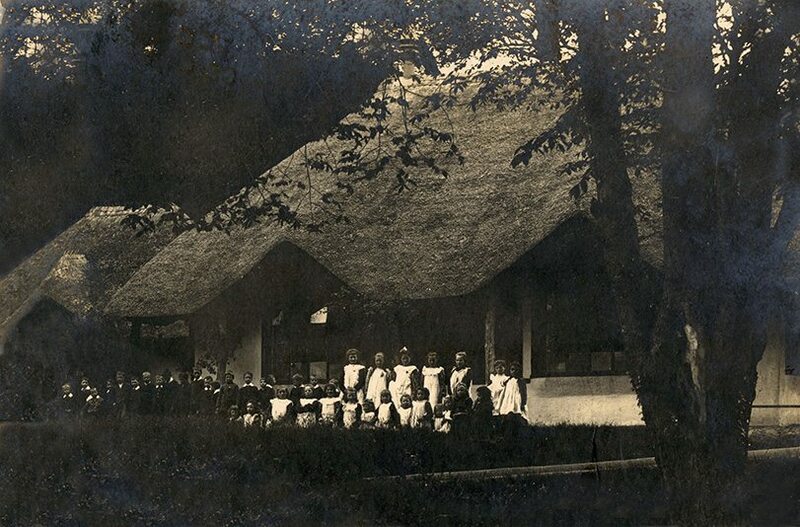 A village with around seventy thatches. 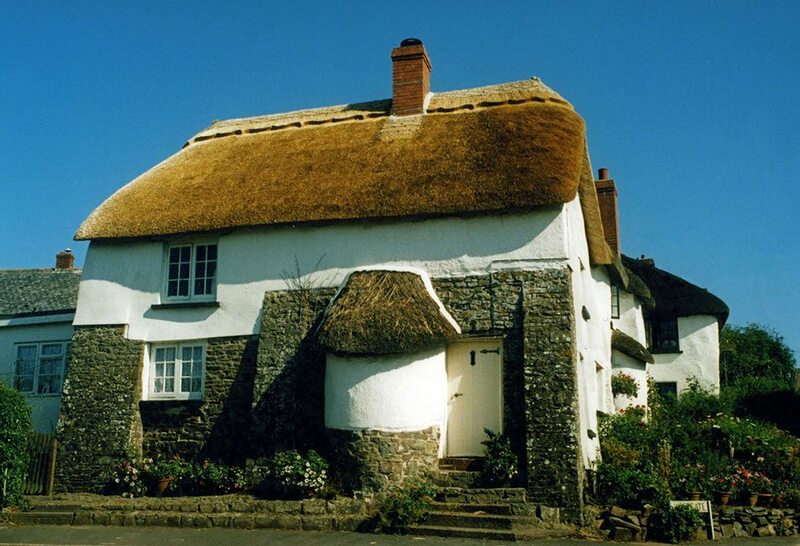 This cottage and twelve others make up what may be the longest thatched row in Britain. It took 112 of my paces to cover the length of the terrace. That’s around 90 metres or 330 feet. 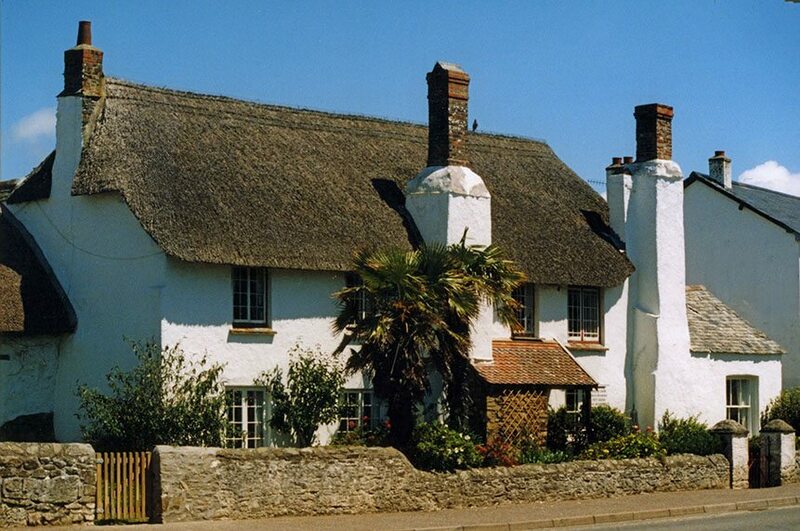 Tudor thatch… Both these cottages date from the sixteenth century. The upper cottage at Lapford still has it’s thatched rounded bread oven. The main roof being newly coated in combed wheat reed. The lower cottages are just a few of many, at Chumleigh. 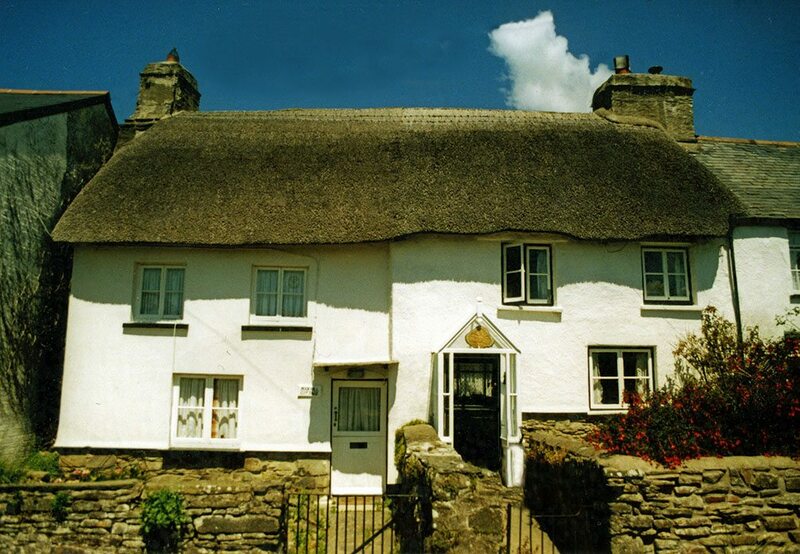 Rhyming thatch…Old Mother Hubbard’s Cottage at Yealmpton, has long been associated with the nursery rhyme by Sarah Martin; published in 1805. But this is no mere cottage. The building being in fact a Tudor Hall House. And has hardly changed since this photograph was taken, over a century ago. 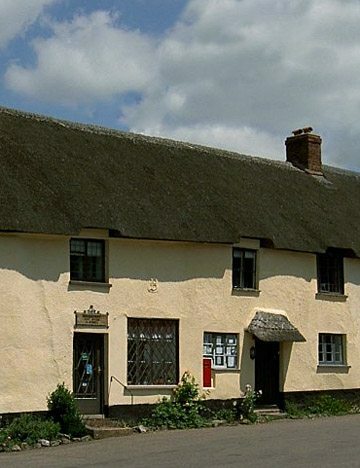 ‘Memorandum of conviction of Robert Forde alias Road of Honiton, thatcher, for profanely swearing four oaths at the Dolphin inn in Honiton, by which he incurred the penalty of 12s. to the use of the poor of Honiton, this being his fifth conviction’. ‘Presentment against William Hawkins, junior, late of Crediton, thatcher, and John Balson alias Gooding of Crediton, thatcher, for feloniously stealing 16 niches of reed, valued 2s. 8d. and one bundle of spars, valued 5d’. ‘Presentment against Charles Leete of Colaton Raleigh, thatcher, for feloniously stealing at Otterton one ladder, valued 1s., the goods of Thomas Braddick’. These last two cases involved a sum of under five shillings, which meant a conviction would rarely, if ever, include the death penalty… However one Devon thatcher was accused of a crime, which nearly always resulted in execution. Richard Quaintance of Heavitree, now part of Exeter, worked as a jobbing thatcher, in the 1820’s. He became estranged from his wife and family and moved into the home of Kerziah Westcombe and her husband , as a lodger. Working for John Horrell a local thatcher. What followed was a classic tale, of a love triangle, a quantity of arsenic and the death of the husband… The two culprits made a poor job of their crime and were soon on trial, at the Exeter Summer Assizes, in 1829. The jury took just six minutes to reach their verdict. It seems Richard was spared the final indignity, of dissection at the Devon and Exeter Hospital; his body being returned to his family. 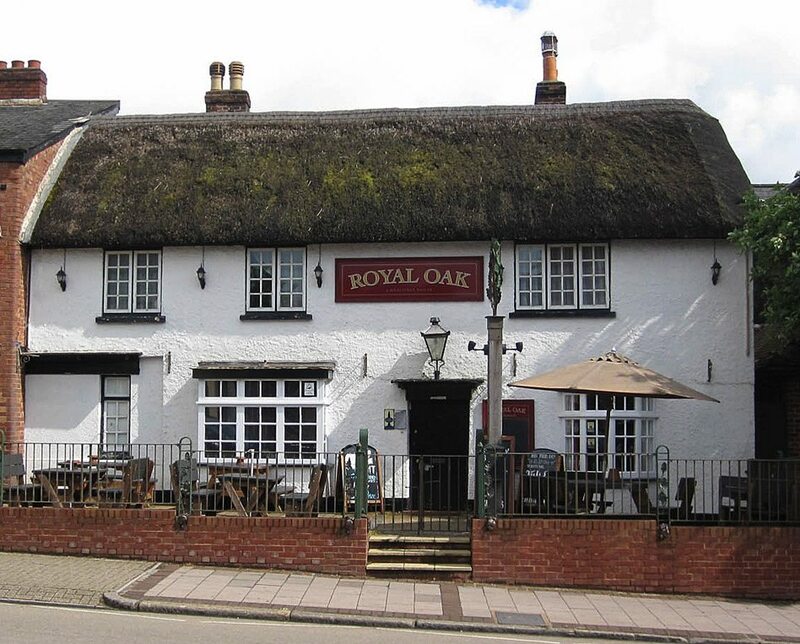 Heavitree… The Royal Oak is the only surviving thatch, in this parish. The pub moved into this building in Richard and Kerziah’s day. Being restored after bomb damage, in the ‘Exeter Bliz’ of 1942. Fire risk… No one seemed too worried, in the inter war years it seems! 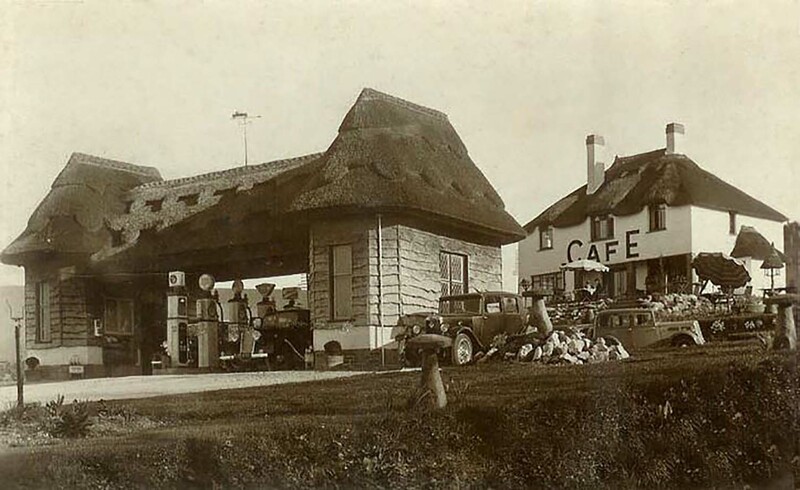 This image, of the garage and café at Haldon Hill, to the west of Exeter, shows some Norfolk reed thatch, done in an East Anglian style. The café behind seems coated in a more local fashion. There was at least one other thatched petrol station at this time, in Oxfordshire… But not enjoying such a busy location, as this is where holiday makers struggled up Haldon and Telegraph Hills, on their way to Plymouth and Torbay, until the early 1970’s… Although the thatched petrol pumps were long gone by then.